The ultimate guide to Brides Les Bains ski holidays. Looking for a way to ski on a shoestring? Then look no further, because Brides Les Bains is a fantastic location to access the outstanding 3 Valleys skiing experience for less! Amazing pistes and spectacular views await before returning for an evening of drinks and relaxation in this traditional French spa village. The petite, attractive village of Brides Les Bains sits just down from Meribel in the lovely Allues Valley. If you’d like to avoid the touristic nature of usual ski resorts and try somewhere more cultural then you’ll be happy to know that the village has stayed true to its roots with a very French look and feel. Natural thermal waters occurring in the valley resulted in the village becoming a hotspot for health and spa treatments since the early nineteenth century. There is an amazing Grand Spa to be found which drew in the crowds with its pampering facilities even before the village became a ski destination. Tranquillity is the theme here, with no blasting après scene and ruckus kept to a minimum. Despite this, there are still a few select bars to have a boogie in and as for meals you can find some brilliant restaurants serving fondue and Savoyard specialties. The reputation and popularity of the resort has grown over the years as a cost-effective way of experiencing the 3 Valleys ski area without the high price tags found higher up. First established as a ski resort for the 1992 Winter Olympic Games, the Olympe Gondola climbs from the centre straight up into the heart of Meribel at 1450m. You can relax with a coffee or a hot chocolate on the gondola from town which takes 25 minutes to reach central Meribel. The first gondola leaves early before the lifts at the top open so you don’t have to miss out on any potential ski time. A top-tip is to hire a locker at the foot of the gondola to save carrying your ski equipment there every morning. Alternatively, if you’ve driven to the resort or hired a car you can drive your way up to Meribel. Guests are exposed to the same skiing opportunities they would be staying higher up; with a Meribel pass alone providing access to 150km of prepared pistes or a 3 Valleys pass broadening the range to a staggering 600km. The 3 Valleys is quite simply the largest linked ski area in the world, so you can find slopes suitable for all abilities and more on top! View our detailed Brides Les Bains snow forecast or snow report and see all live webcams, piste maps, road and travel maps and lift pass prices. For a picture of historic snow conditions see the snow depths month by month with our Brides Les Bains snow history. With direct access into Meribel of the 3 Valleys, the world’s largest linked ski area needs little introduction. Careening pistes for all ages and abilities are available across this gigantic landscape. Beginners can practice in the ‘ZEN Zones’. The greens above Altiport are reachable straight from a nearby gondola once you arrive in Meribel, situated in a peaceful area for learning at a comfortable pace. Children and adults can find some excellent ski schools available to get going on learner-friendly sections. There are little jumps, corners and slaloms in the Acticross area which kids will enjoy. The possibilities are endless for the more intermediate skiers since there is a vast number of blues and reds across the valleys. The Lapin is an ideal blue run for brushing up on your carving skills, while the reds down from the Mont Du Vallon are popular challenges. Such a huge amount of slopes to explore means you can expect to cover new routes and discover new tracks each day. Advanced skiers head to the black runs like Les Bosses and Bartavelle to get their thighs burning. La Face is another must-ski black run which played host to the women’s downhill in the ’92 Olympics. With a 3 Valleys pass, experienced skiers can access the slopes around other resorts like Courchevel and Val Thorens for more variety, higher altitudes and a wealth of freestyling and freeriding opportunity. Get to know your avalanche safety and venture off-piste with a mountain guide who can show you where to find some amazing powder in the area. When it comes to snowboarding the terrain is equally as varied for all abilities, and since there are only 13 drag lifts in the Meribel area you’ll spend most journeys travelling upwards on the modern chairlifts. Freestyle fanatics will be pleased with the two main snow parks to be found. The Moon Park has a variety of rails and boxes, good for first-timers and developing intermediates. The Plattières Snowpark houses a plethora of professional rail, ramps, an air bag and a boardercross run. There is a small selection of bars here but aprés ski is generally better suited to those who are happy to return back to base and unwind with a quiet sherry - don’t expect to find many booming après bars. However, since Brides Les Bains is lower down in the mountains, the drinks tend to be cheaper. Most noteworthy for an evening of entertainment is the local casino. Found within is the Blue Night club, open until late featuring karaoke and disco nights. Groups looking to quench their après thirst might consider hopping on the weekly free shuttle bus to end their day in a more upbeat scene at Meribel and then split a taxi back down after the gondola has closed. For meals, most of our hotel holidays come as half-board and prepare hearty traditional cuisine to energise hungry skiers. There’s a small selection of restaurants to choose between - La Grillade is a pizzeria which makes tasty pizzas for eat-in or take-away. For lunch up the mountain there are a dozen eateries up the slopes in Meribel. The star attraction of the resort is Le Grand Spa Des Alpes, the largest spa in the region, for its luxurious beauty treatments and spa sensations. Unrivalled as the best way to unwind after skiing, or for a lazy day off the slopes, they pamper customers with an extensive range of massages and specialist treatments to ease away aches and pains. The resort has a cinema which airs English versions of the latest flicks and a local market is held weekly in the village centre. There is also a little ice rink or for something different, have a go at paragliding or snow-shoeing. When is the best time to ski Brides Les Bains? At 600m altitude it is uncommon for the snow conditions to be good enough for skiing right down in Brides Les Bains, but most of the slopes higher up around Meribel are good for skiing all season from December until April. Bride Les Bains is a good choice any time during the season due to its location in the linked 3 Valleys, with a total 600km of marked runs including snow-sure Val Thorens and mixed slopes facing different directions for good conditions all day long. Since 80% of the pistes are above 1800km, fresh powder is relatively frequent and the snow is rarely in bad shape. The slopes are groomed daily to maintain their good quality, and a massive third of them are covered by 700 snow cannons to assist in case the snowfall is lacking. Snow records indicate the very best time to ski here is between January and March but if the area is blessed with some late season snow as in previous years, you can enjoy some incredible spring skiing. Families have a fantastic time in Bride Les Bains. 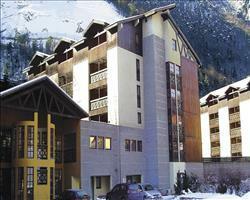 It’s in a perfect location to enjoy skiing the amazing 3 Valleys at an affordable price tag. We’ve got discounted deals on great value accommodation so that you’ve got more money to treat yourself with abroad! Call our ski holiday specialists and see if we can’t find the perfect place for you and your family to stay this season. One of our favourites for families, the Cybele Apartments were recently refurbished and sit in a nice quiet spot outside of the village centre. A ski shuttle will take you straight to the gondolas where you can hire a locker to store your ski equipment to save dragging it back and forth – simple! The Olympe Gondola provides direct access from the village into central Meribel, which was awarded the Famille Plus label because of just how well it facilitates families. Kids and adults alike learn to ski and snowboard on the tranquil ‘ZEN Zone’ green runs. Children will surely enjoy the designated zone for discovering wildlife and a mini snowpark too. Teens might enjoy trying the rails in the good-for-beginners Moon Park. There is a great selection of top-notch ski schools available which employ modern techniques to get kids finding their feet on skis in no time! Back at base, little ones will have fun playing in the snow and skating on the ice rink in the village. Young families seeking childcare should look at our accommodation with day care, kids clubs and babysitting services. Brides Les Bains is renowned as a great little retreat for groups to ski the varied and extensive 3 Valleys on a budget. There is a mountain of slopes (excuse the pun!) 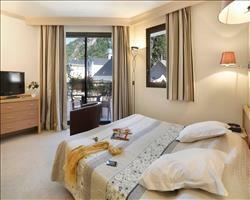 for all different abilities and a choice between some very pleasant accommodations in this lovely spa resort. Hotel Amélie is one of the larger hotels – a good option for bigger groups looking to book together that is more likely to have vacancies in case any stragglers want to join in later. 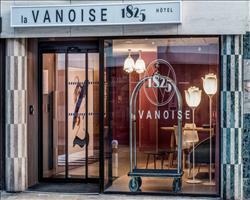 Hotel La Vanoise is slap-bang in the village centre and just a couple of minutes from the gondola for easy access to the slopes. 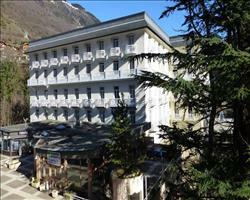 Apartments can work for groups too – Le Grand Chalet Studios are just a few minutes walk away from the gondola. The gondola from Brides Les Bains gets skiers and snowboarders up the mountain in 25 minutes to arrive at a central spot in Meribel. There’s 150km of pistes to explore in Meribel, 80% of which lie above 1800m – great for snow conditions all season. Back in the village, you’ll find a small selection of bars for a quiet sherry together. Try your luck one evening in the local casino and end up in the Blue Night club for dancing the night away! Take the afternoon off and book a session in the Grand Spa to ease away those aches after a day on the slopes. If our accommodation isn’t cheap enough already, ask us about our extra group discounts! Our best holiday packages can include flights and transfers to tie up all the loose ends for a nice and easy booking. Alternatively you can book a self-drive package and make your own way to the resort. Give our friendly experts a call and we’ll help you find the right accommodation for you and your group this season. I stayed in Brides les Bains for a weekend and read an awful lot of reviews that complained about having to get the gondola in to meribel...what a drag. I completely disagree! For practically half the price we stayed in a charming hotel and in the mornings walked the short distance to the gondola which operated from the early hours. Yes it's 20 minutes but it has beautiful views over the different resorts as you ascend and the journey woke us up in the mornings. Once you arrived you were on the top of the base station of meribel. I barely remember the gondola ride but I definitely remember the extra spending money I had! We were beginner boarders for the weekend so chose to board back to meribel and catch the gondola back down at 4.30 but if we had been skiing we would have skiied down half way and caught it from a lower station which shaves off some time. Brides is lovely, it has some nice little shops and is quiet and calm. We had a lovely hot chocolate in a little cafe on the main road. Granted there isn't much in the way of night life but if you're there to ski and your hotel is nice enough (we had evening drinks at the bar in our hotel) then it really doesn't matter. If you are beginners like we were then get pay for a day pass for around 40 euros which got us the main meribel area and mottaret to practice on the magic carpet. You have to buy it in the mornings from the lift station in Brides but was more than enough for us novice boarders and a lot cheaper than any other option. Would definitely recommend staying in Brides if money is tight. "Cheap way to ski Meribel"
The reason we picked Brides les Bains is because it’s much cheaper than staying in Meribel itself but you can still ski the Meribel area. Once you’ve got the gondola up you have access to loads of good slopes. We skied in all 3 resorts: Val Thorens has quite good views and is the highest resort anyway so you’re kind of guaranteed snow, which is one of the reasons we picked the area. Courchevel was a bit rubbish and we couldn’t really see what all the fuss was about but Meribel was really good. Brides les Bains itself is a small and relatively quiet village but there’s a pretty good bar that had happy hour when you get off the gondola.